With electronic music festivals springing up like weeds across the U.S., many of them featuring the most populist line-ups money can buy, Movement seems like the wise granddaddy of the scene, showing the youngsters how it should be done. Despite pulling equally large crowds, the festival’s organizers, Paxahau, have not moved away from booking underground-friendly line-ups even as they make nods to the wider milieu. Purists may disagree, but from where we’re sitting 2012 is one of their most solid line-ups in years. As such, LWE have put together our guide to the festival, complete with our picks of the three-day festival’s can’t-miss moments (denoted by our logo). Yes, we know some of your favorite artists didn’t get picked, but with five stages running simultaneously that’s a choice you have to make. 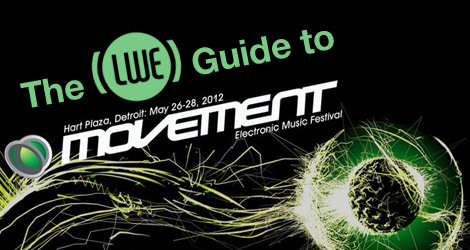 We’ll follow it next week with a guide to the many afterparties that accompany the festivities. Why don’t you guys also add on to this with some after parties you think are worth checking out? Offish and unoffish. You might want to read more closely, bud, that’s what the intro says they’re gonna do. Oh thanks Anton, I truly appreciate you pointing that out to me bub! flabbergasted that you don’t think Tony Ollivierra and Marcellus Pittman are must-sees. and yes, the rest of the party where omar s is playing live is so bad as to negate going just to hear him play live.